Liu Guangding, a geologist whose work served as the scientific backbone for China's offshore oil and maritime development, died on Tuesday afternoon. He was 89. An official at the Institute of Geology and Geophysics of the Chinese Academy of Sciences, where Liu served as director from 1989 to 1993, said Liu died in Beijing from an illness. The official didn't elaborate. Hailed as the father of Chinese marine geology, Liu dedicated his life to the pursuit of the country's energy and maritime interests. After working more than 30 years at sea, he helped create China's first and most comprehensive charts of the ocean floor in nearby waters in 1992. The charts detail China's marine topography, geodynamic features, natural resources and other key data across nearly 3 million square kilometers of territorial waters. The charts later became the go-to reference for China's offshore oil and gas industries, as well as for marine disaster management, navigation and protection of national maritime sovereignty. He also won two second prizes in the State Natural Science Awards - one in 1982 and the other in 1995. 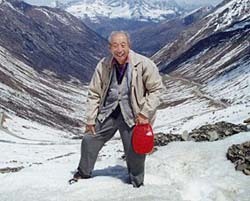 Liu was the first scholar to teach seismic and marine geophysical surveying in 1952 at the Beijing Academy of Geosciences, the predecessor of the China University of Geosciences. In 1980, he became an academician of the Chinese Academy of Sciences. His students and colleagues often raved about Liu's ingenuity, humor and chivalrous charm forged in the turmoil of war. Born the eighth child of an intellectual family in Penglai, Shandong province, Liu's childhood was scarred by the Japanese invasion of China. When he was around 6, Japanese kids severely beat Liu for helping other Chinese children stand up to Japanese bullies at their elementary school in Qingdao, Shandong province. His father, Liu Benzhao, had to leave his family to flee Japanese persecution of Chinese scholars. His mother, Dong Lin, committed suicide when Liu was 11 after sustained harassment by Japanese troops. Seeing how atomic bombs had devastated Japan in 1945, Liu became absorbed with nuclear physics and tai chi, two subjects he believed could empower him to fight Japanese aggression. In the summer of 1951, Liu, a physics junior at Peking University, interned at the petroleum office of noted geologist Chen Ben in northern Shaanxi province - home to China's first oilfield, the Yanchang Oilfield. Seeing a young talent like Liu so hellbent on making nuclear weapons, Chen told Liu: "China's poverty can't be solved by the atomic bomb. Only by developing oil can China rise economically. It is more practical." After a nightlong chat, Liu changed his mind and began what became a lifelong career surveying earth for oil. In 1958, he created and led China's first marine geophysical exploration team to survey the Bohai Sea. Lacking advanced equipment, Liu and his team had to use explosives to create sound waves to detect the seafloor. They also tied receiving devices to telephone wires, and modified land equipment so it could be used at sea.